Pixar's next film will dare to go into a confusing, scary and extraordinary place, the mind of an eleven year-old girl. 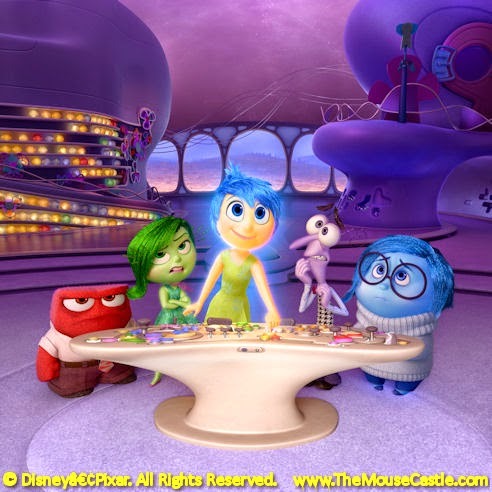 Inside Out is the story of young Riley, who moves with her family from the Midwest to San Francisco and encounters all the hectic mental turmoil that comes with having a major life change at that age. We get to see it all play out through the emotions that occupy her head: Joy (Amy Poehler), Fear (Bill Hader), Anger (Lewis Black), Disgust (Mindy Kaling) and Sadness (Phyllis Smith). Although Joy is used to running the show, all her fellow emotions begin jockeying for position and control in the wake of all the change. The film is directed by Pixar veteran Pete Doctor (Monsters, Inc., Up) and co-directed by Ronnie del Carmen. It opens in the U.S. on June 19, 2015. Inside Out is a film I'm super excited to see. I already love the look and feel of the little bit we've gotten to see in the trailers. The color scheme is great and the Aerosmith track is perfect.